Very nice staff. Nice to know I now have a place that I trust with my babies. Yes I would recommend your office to all my friends. Thank you. I felt SO much better after Dr. Balsis took the time to explain everything about fleas & ticks to me instead of trying to sort out what is really true on the internet. I also had questions and concerns about puppy vaccines etc, and feel much more informed now on making my decisions on what vaccines for Scooter to have. Loved the haircut he got and the way the groomer interacted with him before and after the cut… he just loved her! We are always pleased with our appointments at Two by Two and the top-notch Veterinarians and staff. Each of our pets over the years has been given professional & compassionate veterinary care. Through the routine well check-ups to the difficult decisions in medical care as a pet age, we have had expert advice with the individual attention that is so appreciated. They always treat your pets as there are their own. Everyone in the office is just awesome to deal with anytime we are there with our pets. The entire staff at Two by Two are always so friendly, professional, and patient with our cats. We recently had one of them in for a procedure. Dr. Lin and the technician did a thorough job explaining the situation to us and gave our pet excellent care and follow up. They are definitely a very caring group of people. Our fur family has been going to Two by Two for over 20 years and everyone from the receptionists to the doctors has provided excellent care for our family. Look forward to many more years with this business. As always everyone at Two by Two gives my fur babies nothing but the BEST!!! Wouldn’t go anywhere else! I love how the entire staff are so enthusiastic about my pet and appreciate him as much as I do! 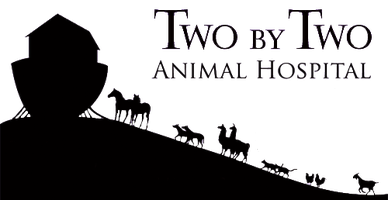 We once again received excellent care and that one on one attention we have come to expect from Two by Two Animal Hospital! Thank you so much! Dr. Balsis is one of the most caring and kind vets. I would trust her to take care of any of my animals. She’s one of the best. I love having my dogs under Dr. Lin’s care. He is awesome!! He is very thorough and take time to explain everything. The techs and vet took their time with us and did a great job evaluating my puppers for their annual exam. The vet, Dr. Shaffer, spent extra time explaining labs and conditions. I wish my human doctors had this much concern for me! I have never had a bad experience here. Dr. Koenigshof was very thorough and a pleasure to deal with. Always enjoy our visits to your office. The staff is always very efficient, friendly and helpful! So pleased with our experience! The customer service is so friendly and helpful, and our Doctor was extremely knowledgeable. We will definitely continue to bring our fur babies here. Dr. Spink and the rest of the staff always take such good care of Lennon! I always appreciate how Dr. Spink takes the time to answer all of my questions. You can tell that she truly loves her job and cares about each animal like they are her own! Always excellent care! Front office staff are so very friendly and helpful! Two by Two is the vet and grooming for my three standard poodles. They have saved their lives more than once. The doctors are truly animal lovers and value every life. They even come in on weekends and late nights for emergencies. Even treated my little granddog on a Saturday. We love them. My little guy is doing well and back to his playful rambunctious self. He is eating and drinking water also. I love Two By Two and the pet health care professionals and staff who serve there. You all have an incredible team. Don’t ever change! Quincy and I thank you! Your doctors and staff have been very kind and compassionate. I really like Dr. Koenigshof. Nothing better. All my expectations are met and exceeded. I love the staff. Always cheerful even on the busiest days. Drs are caring and take time to explain treatments and options. I highly recommend Two by Two to all my friends. Dr. Spink is amazing...just so nice, casual and easy to talk to. I will absolutely be making her my Golden's main vet.